In August 2018 Matheson announced that it will continue its partnership with IMMA. Having commenced in 2015, the successful relationship between the two organisations will focus on ‘Irish Art at IMMA’ over the course of 2018/19. 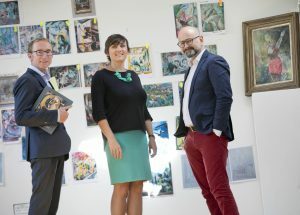 This partnership will see Matheson proudly support a series of Irish artists and Irish art events over the twelve-month period across a range of activities. The ‘Irish Art at IMMA’ series is currently featuring the work of Brian O’Doherty in IMMA Collection: Brian O’Doherty, Language and Space until 16 September. From October, a major retrospective of the work of Mary Swanzy, Ireland’s first modernist, will be exhibited until February 2019 with further exhibitions of Irish artists such as Walker & Walker, Fergus Martin and Janet Mullarney to take place over 2018/19. Matheson has worked with IMMA since 2015 to support some of the most exciting and internationally significant young artists working today. Highly commended at the 2018 Allianz Business to Arts Awards, between 2015 and 2018 the partnership supported over 50 artists and enabled the works by artists including Scottish sculptor and Turner Prize nominee (2011) Karla Black; Irish artist Brian Maguire; Lebanese artist Etel Adnan; British photographer Chloe Dewe Matthews; Irish artist Grace Weir; and new commissions by leading Irish artists including Turner Prize winner (2014) Duncan Campbell, Jaki Irvine and Alan Butler. Matheson has also supported major exhibitions at IMMA by established and international artists such as Rodney Graham, and Frank Bowling.